Thick and chewy Peppermint Mocha Cookies are the ultimate Christmas Eve treat! Because who doesn’t need an extra caffeine boost, right?! ‘Tis the season for cozy sweaters, Christmas trees, peppermint mocha lattes, and cookie trays. 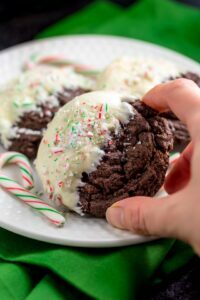 And because I know you love those last two as much as I do, I combined them to create the ultimate holiday treat: peppermint mocha sugar cookies! The cookies themselves are loaded with real chocolate flavor, perky peppermint, and rich espresso. But that’s not all! Because these cookies are also dipped in a bath of creamy white chocolate before being finished off with a sprinkle of colorful crushed candy canes! Sounds SO good, right?! 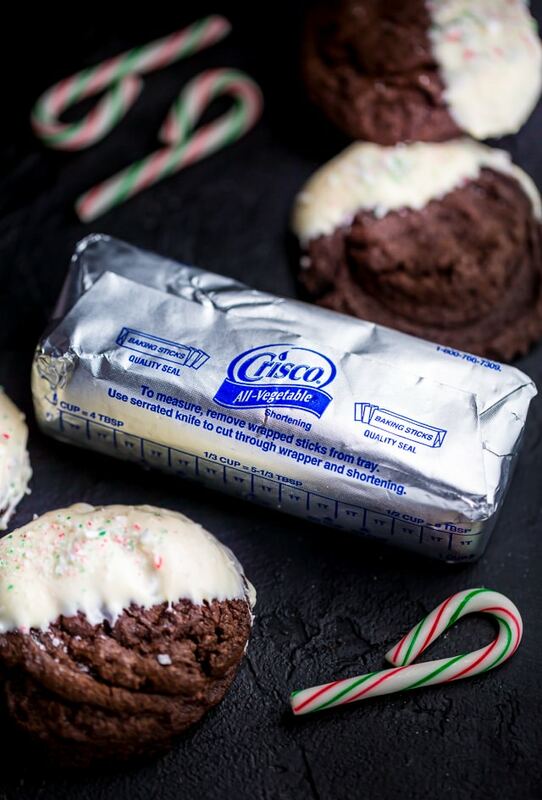 For this festive recipe, I’ve teamed up with Crisco®! I used their all-vegetable shortening in this recipe instead of butter and was thrilled with the results!!! Why? Well, let me you! First of all, I love that their baking sticks are already “at room temperature”. In addition, the shortening creates a thick cookie dough that doesn’t require any chill time. That’s right! You can just whip it up, scoop it out, and bake away! And finally, I love how thick and airy the cookies bake up. I know we’ll be placing a plate of these cookies out for Santa this year! Because between the chocolate and caffeine, they’re his favorite 😉 And after one bite, I bet they’ll be your favorite too. 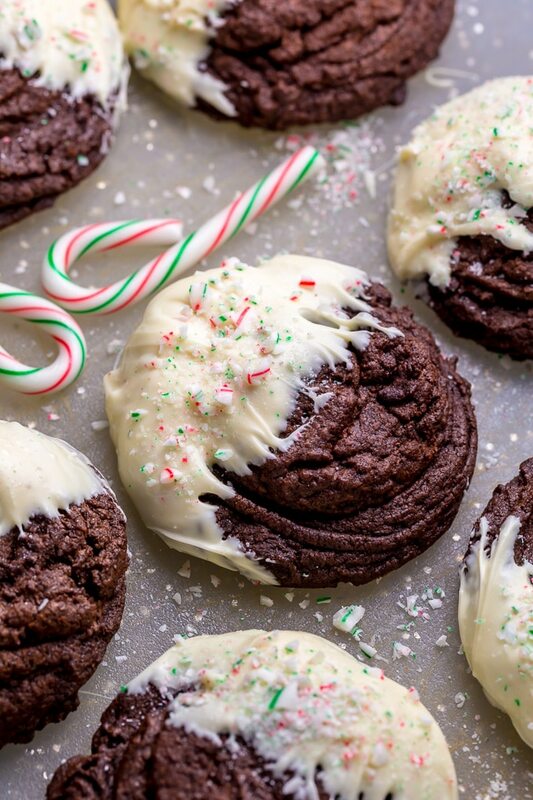 If you try this recipe for Peppermint Mocha Cookies, let me know! Leave a comment below and don’t forget to snap a pic and tag it #bakerbynature on Instagram! Seeing your kitchen creations makes my day. 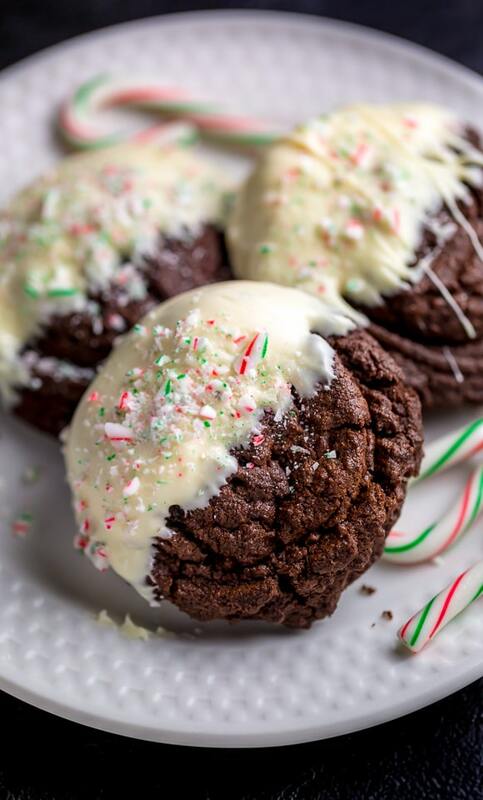 Thick and chewy Peppermint Mocha Cookies! Preheat oven to 350 degrees (F). Line two large baking sheets with parchment paper and set them aside. In a medium mixing bowl, whisk together the cocoa powder, flour, espresso powder, baking powder, and salt until well combined. Set aside. In the bowl of a stand mixer fitted with the paddle attachment, or in a large bowl using a handheld electric mixer, combine the shortening and brown sugar and beat on medium-high speed until light and fluffy, about 3 minutes, scraping down the sides of the bowl as needed. Beat in the eggs, peppermint extract, and milk. Reduce the mixer speed to low and gradually beat in the flour, mixing just until combined. Finally, beat in the chocolate until just combined. Scoop level 1/4 cupfuls of the batter onto the prepared baking sheets, leaving 2-inches between for spreading. The batter will be very sticky, so don't try to handle it with your hands. Bake, one tray at a time, for 9 to 10 minutes, or until the cookies are set at the edges and slightly puffed. Place the baking pan on a wire rack and allow the cookies to cool completely; about 30 minutes. Fill a medium pot one-third full with water and bring it to a low simmer over medium heat. Place a heatproof bowl that will fit on top of the pan snugly, but will not touch the simmering water, on top of the pan. Reduce the heat to low and add the chopped chocolate into the bowl over the pot. Heat until the chocolate is completely melted, stirring occasionally with a silicon spatula. Once the chocolate is completely melted, carefully remove the bowl from the heat and pour it into a liquid measuring cup. Dip one half of each cookie in the melted chocolate, then place it back on the parchment paper lined baking sheet and sprinkle with crushed candy canes. Set aside and allow the chocolate to set, about 1 hour. Store cookies in an airtight container, at room temperature, for up to 2 days. Please clarify, what are “full sized” candy canes? Can you give a combined weight for the amount needed for the recipe? They are the regular sized candy canes, not the mini ones. Can you make these smaller than 1/4 cup and if so does it decrease the baking time? Do you have to use 2 tsp of espresso powder? I’m caffeine sensitive and honestly do not like coffee. These cookies look so good though!!!! can you use butter instead of shortening? Does espresso powder mean just ground espresso beans? Or is it something different? I’ve come across this in a few recipes and am unfamiliar. I just made these. I made them much smaller and got 46 cookies from a batch. They are so pretty and perfect for a cookie tray. Not too overbearing in any flavor. Found to make the perfect cookie we used a heaping half tablespoon and rolled it then kind of halfway smashed it. The dough wasnt too sticky. They turned out perfect shape.